Have you cracked your screen? Broken your charging port? Flat battery on your phone causing you grief? 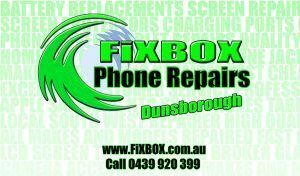 Look no further than FixBox Phone Repairs iPhone Fix Dunsborough wide service. We repair all sorts of phones and tablets. Brands that we service include Apple, Samsung, HTC, Sony, LG, Motorola, Nokia, Microsoft and more. Whether the problem is a battery, speaker, button, screen, back panel, switch, SIM reader, headphone jack, charging port or anything else, FixBox Phone Repairs can help with our iPhone Fix Dunsborough service. Get the iPhone Fix Dunsborough people talk about for your favourite phone or tablet mobile tech device. Call us on 0439920399 for any free advice or an obligation free quote. We always give a quote before commencing work, giving you a stress free experience when trying to figure out what’s wrong with your device. If you can’t call then you can email us at help@fixbox.com.au. Or even better, just wander into the FixBox Phone Repairs store in Dunsborough or the kiosk in Margaret River. Our address in Dunsborough is 9A/42 Dunn Bay Road, with our store located in the conveniently placed Naturaliste Forum. Just look for the main roundabout in the middle of town and you’ll see our signs. Otherwise, if your closer to Margaret River you can find us in the Settlers Arcade at 116-188 Bussell Highway. We’re next door to Target and Squid Lips Fish and Chips. For your next iPhone Fix Dunsborough and Margaret River FixBox Phone Repairs can provide Eftpos and credit card facilities at no extra charge to you. All of our staff are highly experienced with years of knowledge from servicing happy customer’s phones and tablets. Check out our Facebook page to see our great customer reviews and keep up to date with our latest specials and news.